On occasions you may want to import orders into Veeqo, the reason for this is that they may be historical orders that you want in Veeqo or they could be orders from another software solution. You can import orders into Veeqo from a CSV file. Orders from integrated stores will import automatically. 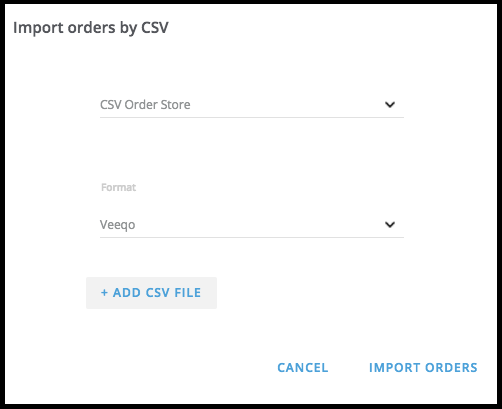 Before you can import a CSV file you need to make sure you have Added A CSV Store to your Veeqo account. You will also need to make sure the product in the orders already exists in Veeqo. Either add the product on one of your stores to create it as a Veeqo Product. Alternatively, manually Create A Product or Import Products By CSV. For a full list of available CSV headers check out the table further down in this article. Here is a sample CSV file for you to use as a template, the columns must match this exactly for it to work. 3. It might take a few minutes to import your orders, you will get a notification when it's finished, you can close the window. If your order has more than one product then create a new line for each product in the CSV file. Below are the headers in an Order CSV file along with the examples. If this was a POS order did a receipt get printed? What stage is the order currently at? The date and time the order was placed on the Webstore/Market Place. Note: This date/time is in UTC and not your companies local time. When an order is canceled in Veeqo the user has the option to provide a reason for this. The entry can be seen in this section of the CSV. It didn’t fit the customer. The email address of the customer who placed the order. This is pulled from the store. The phone number of the customer who placed the order. This is pulled from the store. The mobile number of the customer who place the order. This is pulled from the store. The online stores unique number assigned to the customer. This is pulled from the store. If the customer has entered additional information on the webstore/marketplace this will be shown here. First name of the person to be billed. This is pulled from the store. Last name of the person to be billed. This is pulled from the store. Company name to be billed if available. This is pulled from the store. First line of the address to be billed. This is pulled from the store. Second line of the address to be billed. This is pulled from the store. City of the billing address. This is pulled from the store. Country of the billing address. This is pulled from the store. State of the billing address. This is pulled from the store. Postcode/Zip of the billing address. This is pulled from the store. Phone number of the billing address. This is pulled from the store. First name of the person who will receive the order. This is pulled from the store. Last name of the person who will receive the order. This is pulled from the store. Company name who will receive the order. This is pulled from the store where available. First line of the address to receive the order. This is pulled from the store. Second line of the address to receive the order. This is pulled from the store. City to send the order to. This is pulled from the store. Country where the order is being sent. This is pulled from the store. State that the order is being sent to. This is pulled from the store. Postcode/Zip of the shipping address. This is pulled from the store.